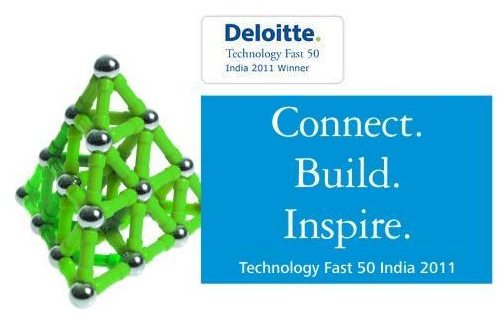 Percept Knorigin Wins The Deloitte Technology Fast 50 India 2011 Award! Certified Rank “_11_” amongst 50 companies and recognised as one of the leading technology company in the Deloitte Technology Fast 50 India 2011 Program. PK Online Ventures Pvt Ltd, India’s fastest growing new media company, won “The Seventh Edition Deloitte Technology Fast 50 India 2011” Award conducted by Deloitte Touche Tohmatsu India Private Limited. The award ceremony took place on October 21, 2011 at Mysore Hall, ITC Royal Gardenia, Bangalore. Percept Knorigin ranked “11th” with a phenomenal “156 percent” revenue growth was recognized as a leading technology company in the Deloitte Technology Fast 50 India 2010 program. The Seventh Edition Deloitte Technology Fast 50 India program annually recognizes the 50 fastest-growing technology companies in India, based on percentage revenue growth over the last three financial years. Operating revenue must be at least US$50,000 in the first year of the three years being analyzed. Company must be in business for a minimum of three years and must be headquartered within India. The technology company must also own proprietary technology that contributes to a significant portion of the company’s operating revenues, manufactures a technology-related product, devotes a significant proportion of operating revenue to research and develop technology. The company should be technology intensive or uses unique technology to solve problems. Percept Knorigin surpassed all criteria of the Deloitte Technology Fast 50 India 2011 award to walk away with the prestigious award yet another time and attain recognition as a leading technology company in the new media space.